OSWEGO, NY – Although it is still summer, the Salvation Army is looking ahead to its annual Red Kettle Campaign, which begins November 14 and ends December 24. From left are: Lt. Phillip Davies, TJ Walker, Cadet Shaun McNeil, George Swatkowski and Art Bennett. Contributions raised through this campaign are critical to our operations which serve those in need within Oswego County throughout the year. The Salvation Army Men’s Club (pictured) is making repairs and touch ups to the kettles and equipment used for the campaign. 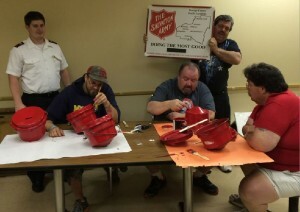 The Salvation Army is requesting the community’s support from individuals, families, or groups willing to volunteer time standing at kettles placed at stores and businesses in Oswego County. If you are interested in helping out or have questions, please e-mail: [email protected] or leave your name and number at (315)207-3359. Their Community Service Center is located at 73 W. Second St., Oswego, and is open 9 a.m. to 4 p.m. Monday through Friday.